Stevie Streck Designs provide a fresh and innovative look at sophisticated invitations and celebratory announcements. Each die-cut invitation created by Stevie Streck can be personalized to suit your commemorative needs, whether it's a save-the-date for an upcoming wedding, or a card extending sincerest gratitude. Each product from Stevie Streck features incredible watercolor designs, which can become customized and made into individual invitations. Whether you're looking for something sparkly, glamorous, chic, or modern, Stevie Streck Designs is your best choice. Each invitation is customized to reflect all the details of the occasion, with festive shapes, styles, and thoughtful minutiae. Every invite adds that caring touch that most customers can only hope for. While DIY invitations are on the rise, people want to take creativity into their own hands. Stevie Streck Designs feature unique invites that cater to those who are more DIY-inclined. Not only do these invitations offer specifics that are rare to generic invitation brands, but you will feel like you're ordering something exclusive each time. This collection of die-cut invitations is unlike any other in the industry. There is also a universality to Stevie Streck invites, which can be used for the majority of occasions within your life. Take the Stevie Streck cupcake invitation, for example. Not only can it be a cleverly customized choice for an upcoming birthday celebration, but it can also be used for a child's birthday party as well! 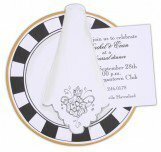 The die-cut designs are comprehensive in their purpose, and truly what you write on the inside is what will direct the invitee on the occasion. These fun and extraordinary invitations are worth perusing in order to find inspiration in your next spirited gathering. If you are in the business of shopping for unique bridal shower invitations, then you've landed in the right place. 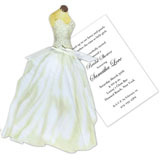 Stevie Streck invites are perfect for your next wedding party soiree. With delicate touches and glitter options, nothing will make you feel more special than with an exclusive design for your special day. There is a perfect balance with Stevie Streck designs that incorporate both poise and femininity, which is an elegant touch for your upcoming bridal shower. Each of the Stevie Streck invites can be perfectly catered to fit your needs, thanks to our personalization process. Looking to switch up the ink color? Step into our office. Need a specific typestyle? Not a problem. Do you want to order up some printed envelopes? Your wish is our command. We want you to feel as if you're in the best hands with every Polka Dot Design transaction, which is why we are willing to go above and beyond to make your invite dreams an easy reality. 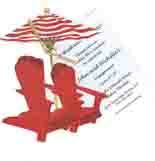 Save BIG on Stevie Streck Design's products for personal or corporate use with Polka Dot Design coupon codes. For more information, contact us at service@polkadotdesign.com or call the Polka Dot hotline 1-877-816-0884.